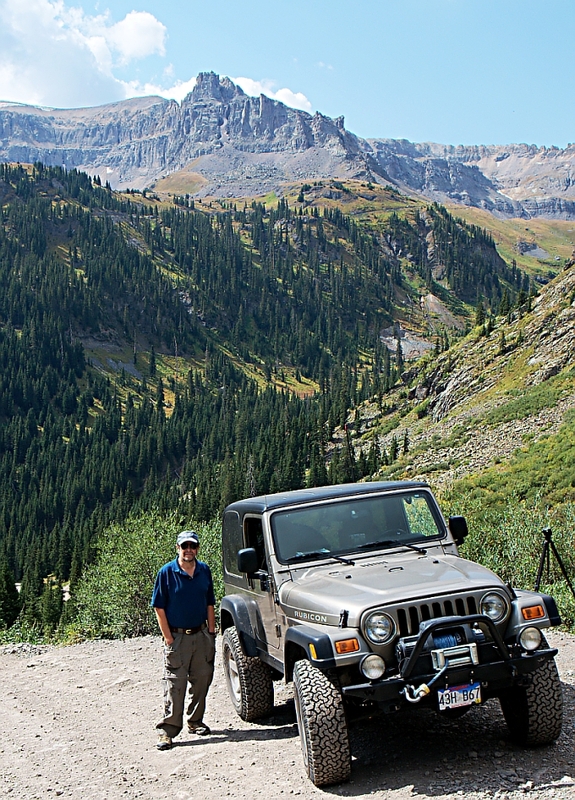 On a lovely early fall day, we took the jeep up to the famous Yankee Boy Basin. The jeep road leaves from Ouray and follows a canyon wall for about 8 miles. The trail boasts a very dramatic rock hangover. I had to wonder if the jeep would fit under it! The trail was originally used in the 1890’s by miners traveling to the famous Camp Bird Mine. In its heyday, this mine provided advanced creature comforts including hot and cold running water, electric lights and steam heat. Tom Walsh founded this mine in 1986 and he felt that the 400 miners who worked there should be treated to a decent lifestyle. He required only 8 hours of work per day rather than the standard 12 hours. His humanitarian approach brought big rewards as he made over 4 million dollars by 1900. I will be posting other pics from the ride on Flickr. Hope you enjoy.